It may not feel like it given all this crazy volatility of late, but this really wasn’t a horrible week for the market. That’s especially the case when you compare it to last week’s 4% plunge across the indices. However, it’s obvious that we still haven’t gotten over the recent pullback brought on by rising rates (and several other challenges). Thank goodness for Tuesday! On that day, the Dow soared by about 550 points. Without that sharp of a rally, the index probably would not have been able to break its multi-week losing streak. It advanced 0.26% on Friday to 25,444.34, giving it a small (but appreciated) weekly advance of 0.4%. Meanwhile, the S&P pretty much broke even for the week, which is impressive given how many days it has been in the red of late. Though it spent most of Friday on the positive side, it couldn’t hold the gain into the close and finished with slight loss of 0.04% (or 1 point) to 2767.78. The NASDAQ remains the most challenged of the Big 3 indices. It dipped another 0.48% (or about 36 points) in today’s session, bringing its weekly loss to around 0.6%. Tech just can’t find its footing right now after leading the way for the past several years, which unnerves a market that has counted on this space's invincibility. Except for positive sessions at Apple and Alphabet, the FANGs again moved lower. Netflix, which is the only FANG to have reported thus far, gained more than 5% in the session after its release but then dropped nearly 9% in the past two. Each of the indices started the day solidly on the plus side, but time proved to be their enemy again as the lead slowly slipped away throughout the session. The market is still haunted by last week’s pullback and the inability to take advantage of Tuesday’s rally. Earnings season has proven to be as strong as was expected, but it isn’t having the positive impact on stocks that we would like to see (though Procter & Gamble’s strong quarter was certainly a big factor in the Dow’s positive day). Surprise Trader: Shares of Arch Coal (ARCH) have been heading mostly higher since a positive surprise of 15% in its most recent quarter. Of course, it's still off its 52-week highs amid this pullback. Given a positive Earnings ESP of 6.3%, Dave thinks this natural resources company is due for another beat when it reports again before the bell on Tuesday. He added ARCH on Friday with a 12.5% allocation. Read the full write-up for more. Large-Cap Trader: "While the major U.S. large cap stock market indexes were flopping around this week, re-testing the 200-day moving average of the S&P500, well-positioned executives were making deals and increasing earnings for their companies. "The latest news out of Micron is a good case to bring to your attention. They are using their huge cash pile to buy out venture partners and do buybacks. They are paying down debt too. "Will the stock market gods care? Eventually. When that actually is, I don’t know. It might be right now, after a successful re-test of the 200-day moving average. Counterstrike: "The 200-day is being threatened across multiple indices. Many stocks have also broken their 200-day, giving technical traders like me a hard time finding comfortable support levels. When markets get like this I like making a wish list. This is a list of 5-10 favorite stocks I have to buy if the market becomes ridiculously oversold. "My thought is that if the 200-day is going to break it will happen next week and we could go straight to 2700 and even my Fib targets at just above 2650. If that level hits, I buy and I buy big long-term. Is Arch Coal (ARCH) Outperforming Other Basic Materials Stocks This Year? 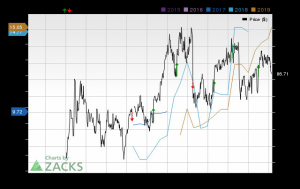 Is Arch Coal (ARCH) Stock Outpacing Its Basic Materials Peers This Year?